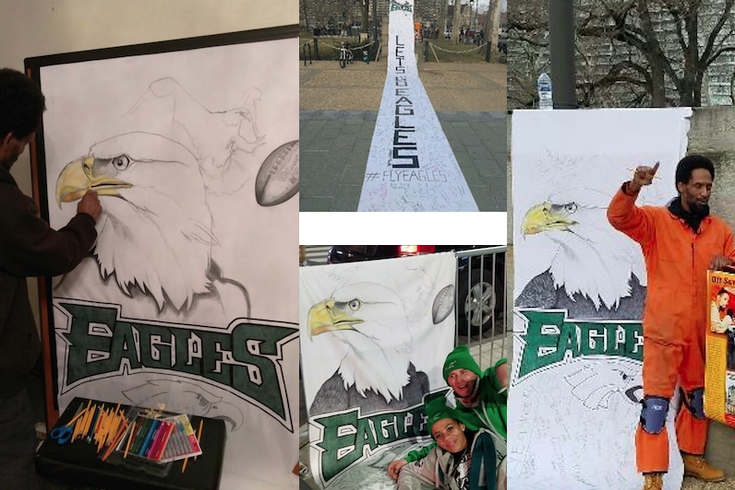 Activist and artist Michael Ta'Bon gathered 5,000 signatures on his 'world's longest cape' during the previous Eagles playoffs game. He wants to top it with another one for the Super Bowl. In recent days, we've talked a lot about crazed Eagles fans, salty Vikings fans' reactions and the two weeks ahead which – in an ideal scenario – will end in a potentially apocalyptic celebration that'll make the Bicentennial look like a book-club gathering. All the while, Michael "O.G. Law" Ta'Bon has been out rallying support for the Birds in a unique way that, he hopes, will also help youths avoid the same lifestyle that landed him behind prison walls for nearly a decade. He's done so with the thought that the football team's recent successes are bringing people of all races, religions, creeds and political mindsets together in ways rarely seen around these parts. If Ta'Bon's name sounds familiar, it's because you've seen, or heard about, his "Un-Prison Cell" or the G-Law National Love Team and Fight Hate With Love movement that he created in Philadelphia upon his release. The former is a makeshift prison cell that the orange jumpsuit-sporting artist and activist built, and "served time" in, throughout Philadelphia, to lend visceral credence to his words. But in recent days, Ta'Bon has adapted his approach of dragging long banners alongside marching protesters. "I usually drag capes with positive messages and world-healing solutions," he said. This time, he's hauled what he's calling "the longest cape in the world" around the city – from the Philadelphia Museum of Art steps and Center City to Chickie's and Pete's and Lincoln Financial Field – inviting fans to sign add messages of support for the team. The ultimate goal is to auction it off to help raise funds for a 14-foot box truck for his National Love Team: Love Over Violence mission. Considering he's gotten about 5,000 signatures on one already, he's currently working up a new HeartWork Eagle Cape for the days leading up to the Super Bowl. "It's a world-record-long cape, outdoing Superman, Batman, James Brown and all the rest," he said of the item on which he draws Eagles messaging and logos using a No. 2 pencil, Sharpies, Gorilla tape, razor blade and crayons. He said hearing negativity about the Eagles' playoff history, and people doubting their chances this year, is what inspired him. "I looked at it as an opportunity to make history, noticing how the games have a tendency to bring people together who would normally be fighting," he said. "Black people, white people, Chinese people and Latin people all on the same page celebrating with happiness and joy. "If you slow down the tapes and look at the different faces of the people, different religions, ethnic groups, colors and cultures coming together as one. That's something that I can get behind as the love champion of Philadelphia." He and his team have seen it in the reactions from fans who've signed the cape, and he hopes it'll continue when he breaks out the new one in the coming days. "We would love to get more signatures before the Super Bowl, and to have some students count the names and put a party together for everyone who signed the cape," he said. "I would love it if the Eagles participated, too!" Ta'Bon invites anybody interested in learning more about the capes to give him a call at (267) 905-7410 or check out his GoFundMe page.